button on your website, marketing pages, blog posts, and other properties. This lets domain administrators install your apps with a single click without leaving your site. Once they click the button, administrators can enable your app for all users (or just some of them) just like they would from the Google Apps Marketplace. Check out the developer documentation to start integrating today. Hiranmoy Saha is a Software Engineer working on the Google Apps Ecosystem. To increase the discovery of your Google Apps Marketplace listings, you can now embed an Integrate with Google button on your website, marketing pages, blog posts, and other properties. This lets domain administrators install your apps with a single click without leaving your site. Once they click the button, administrators can enable your app for all users (or just some of them) just like they would from the Google Apps Marketplace. Named ranges are a popular feature of the Spreadsheet service; and now, you’ll be able to do something similar in the Document service. With named ranges, your scripts can tag a section of a Google Doc for later reference. For example, a bibliography script could set a named range on every citation in a document, then easily update the citations in the future. You can use a similar API to manage bookmarks, too. Unlike named ranges, bookmarks are visible to the user and allow you to link to a particular place in a document. Also for Google Docs, we've added the server-side methods setCursor(position) and setSelection(range) to change the user's cursor position or active selection, plus a client-side method, google.script.host.editor.focus(), which switches the browser focus from a sidebar or dialog back to the document. Oh, and hey: the Undo command in Google Docs can now revert changes made by a script. If you've used HTML service much, you'll know that the Caja security sandbox has two modes. NATIVE mode imposes fewer restrictions than EMULATED mode and generally runs faster. As of today, NATIVE is now the default if you have not specified which mode your script should use. In a few edge cases, this may affect how existing web apps operate; if so, simply append .setSandboxMode(HtmlService.SandboxMode.EMULATED) to your HtmlOutput object to restore the old behavior. 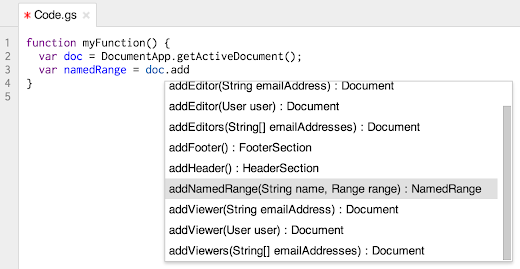 In preparation for future improvements to Apps Script, we've revamped script properties and user properties, combining them into a unified Properties service and adding the notion of document properties, which are (surprise!) specific to a particular document, but shared among all collaborators. The biggest change is that user properties are no longer shared between scripts, but our guide to the Properties service provides all the details. As part of the change, the old ScriptProperties and UserProperties services have been deprecated, although they will continue to function in existing scripts until a sunset date is announced. We’re excited to bring you these new tools. With these new additions, we have also deprecated Finance service. It will remain available for the next six months but will be turned off on September 26, 2014. Developers like you have built amazing scripts with Apps Script, and we want to make Apps Script even more useful. 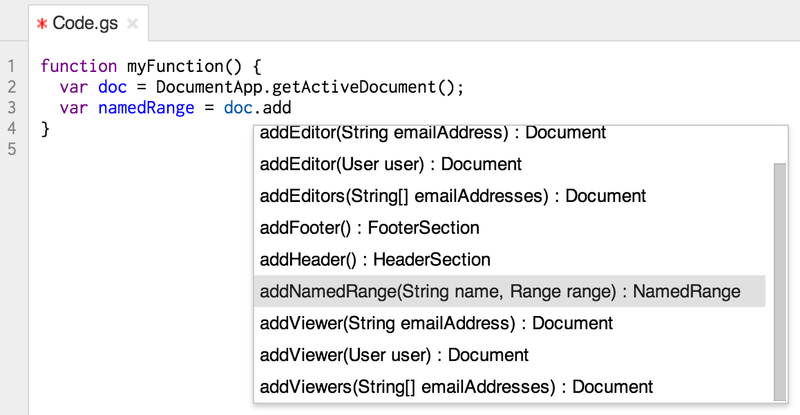 We've been working hard to add a variety of new APIs and features in Google Apps Script. Today, we're ready to share a few of them with you. # Google Apps Marketplace V2 SSO. Note that :access_type is set to online. This is necessary to prevent the authorization prompt from being presented to a SSO user. Omniauth defaults to an :access_type of offline. That's all it takes. With this OmniAuth strategy in place, when a domain administrator installs your application SSO will be available across the domain. To support Yesware's reminder functionality, we needed offline access to a user's email account. In the past, this functionality was supported through 2-legged OAuth. In the new Google Apps Marketplace paradigm, OAuth 2.0 Service Accounts are the replacement. In the Cloud Console, generate a private key for the OAuth 2.0 Service Account associated with your Google Apps Marketplace project. Download the .p12 private key generated. Place this key somewhere that will be accessible by your production servers, e.g., a certificates folder in your codebase. We used the Google API Ruby Client gem to generate an access token from our Service Account's keys. # to password protect the key. With OAuth 2.0 Service Accounts, the underlying libraries we used to interact with Gmail remained the same. There were simply a few extra steps necessary to obtain an access token. Yesware provides a Gmail Contextual Gadget, for scheduling email reminders. To facilitate this, it's necessary that the gadget interact with a user's email account. To make this a reality, we needed to implement SSO through our contextual gadget. Google provides great reading material on this topic. However, the approach outlined concentrates on the deprecated OpenID-based SSO approach. We used a slightly modified approach. # Store the opensocial_viewer_id in the session. # gadget to a user account. Once an opensocial_viewer_id was connected to a Yesware user, we could securely make API calls from our contextual gadget. To cut down on the ritual surrounding this, we wrote a Devise Google Apps OpenSocial Strategy for authenticating the OpenSocal signed requests. Once we figured out all the moving parts, we were able to use mostly off the shelf mature libraries for building our Google Apps Marketplace Integration. I hope that this retrospective look at our development process helps other Rails developers hit the ground running even faster than we did. 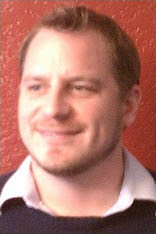 Benjamin Coe cofounded the email productivity company Attachments.me, which was acquired by Yesware, Inc., in 2013. Before starting his own company, Ben was an engineer at FreshBooks, the world’s #1 accounting solution. Ben’s in his element when writing scalable cloud-based infrastructure, and loves reflecting on the thought-process that goes into this. A rock-climber, amateur musician, and bagel aficionado, Ben can be found roaming the streets of San Francisco. Replacing OpenID with OAuth 2.0 for Single-Sign-On. Replacing 2-legged OAuth with OAuth 2.0 Service Accounts, for delegated account access. Releasing a Gmail Contextual Gadget that worked within these new authentication paradigms. We should like to share some of the decisions we made, and challenges we faced, upgrading our production Ruby on Rails application to support the improved Google Apps Marketplace. OAuth 2.0 credentials are created in the Cloud Console, within the same project that has the Google Apps Marketplace SDK enabled. When accessing your application, a user is put through the standard OAuth 2.0 authentication flow using these credentials. If the user has the Google Apps Marketplace App installed they will be logged directly into your application, skipping the authorization step. in May 2013, we’ve been constantly improving it based on your feedback and feature requests. Our first API updates of 2014 bring some features at the top of your requests: push notifications for users, push notifications for activities, and structured user search. Tired of polling user resources to detect changes? With push notifications for users, you can watch for changes to user resources and receive notifications from the Directory API whenever a watched user resource changes. Check out our user notifications developer guide to learn how to improve the performances of your application by eliminating the extra network and compute costs involved with polling user resources. Do you want to be notified when changes to a certain document occur or specific events such as the change of a user’s password happen? With push notifications for activities you can watch for changes to activities resources, and receive notifications from the Reports API whenever a watched activity resource changes. Check out our activities notifications developer guide to learn how to receive notifications for the activities of your interest. Do you want to know which users in your domain are members of a certain organization, or which users have a common manager in their reporting chain? The new query parameter we’ve just added to the users.list method of the Directory API allows you to perform rich queries over most attributes from the user profile. Check out our user search developer guide for a more comprehensive guide on how to build your queries and more examples of what you can do. Silvano is a Developer Programs Engineer on Google's Admin SDK. Before joining Google in 2011, he has worked in Finland, Italy, Spain and the UK, writing web based configuration management tools for ISPs, social networks, web based training materials, e-commerce apps and more. Since we launched the Admin SDK in May 2013, we’ve been constantly improving it based on your feedback and feature requests. Our first API updates of 2014 bring some features at the top of your requests: push notifications for users, push notifications for activities, and structured user search.